4. Using small d.c. machine coupled to it. In this method, the rotor is brought to the synchronous speed with the help of some external device like small induction motor. Such an external device is called ‘pony motor’. Once the rotor attains the synchronous speed, the d.c. excitation to the rotor is switched on. Once the synchronism is established pony motor is decoupled. The motor then continues to rotate as synchronous motor. In a synchronous motor, in addition to the normal field winding, the additional winding consisting of copper bars placed in the slots in the pole faces. The bars are short circuited with the help of end rings. Such an additional winding on the rotor is called damper winding. This winding as short circuited, acts as a squirrel cage rotor winding of an induction motor. The schematic representation of such damper winding is shown in the Fig.1. Fig . 1 Starting as a squirrel cage I.M. Once the rotor is excited by a three phase supply, the motors starts rotating as an induction motor at sub synchronous speed. Then d.c. supply is given to the field winding. At a particular instant motor gets pulled into synchronism and starts rotating at a synchronous speed. As rotor rotates at synchronous speed, the relative motion between damper winding and the rotating magnetic field is zero. Hence when motor is running as synchronous motor, there can not be any induced e.m.f. in the damper winding. So damper winding is active only at start, to run the motor as an induction motor at start. Afterwards it is out of the circuit. As damper winding is short circuited and motor gets started as induction motor, it draws high current at start so induction motor starters like star-delta, autotransformer etc. used to start the synchronous motor as an induction motor. The above method of starting synchronous motor as a squirrel cage induction motor does not provide high starting torque. So to achieve this, instead of shorting the damper winding, it is designed to a form a three phase star or delta connected winding. The three ends of this winding are brought out through slip rings. An external rheostat then can be introduced in series with the rotor circuit. So when stator is excited, the motor starts as a slip ring induction motor and due to resistance added in the rotor provides high starting torque. The resistance is then gradually cut off, as motor gathers speed. When motor attains speed near synchronous. d.c. excitation is provided to the rotor, then motors gets pulled into synchronism ans starts rotating at synchronous speed. The damper winding is shorted by shorting the slip rings. The initial resistance added in the rotor not only provides high starting torque but also limits high inrush of starting current. Hence it acts as a motor resistance starter. 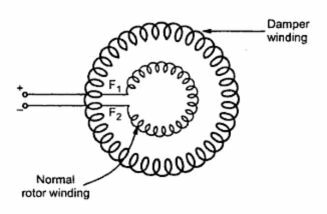 The synchronous motor started by this method is called a slip ring induction motor is shown in the Fig.1(b). Fig. 2 Starting as a slip ring I.M. It can be observed from the Fig. 1(b) that the same three phase rotor winding acts as a normal rotor winding by shorting two of the phases. From the positive terminal, current ‘I’ flows in one of the phases, which divides into two other phases at start point as 1/2 through each, when switch is thrown on d.c. supply side. Many a times, a large synchronous motor are provided with a coupled d.c. machine. This machine is used as a d.c. motor to rotate the synchronous motor at a synchronous speed. Then the excitation to the rotor is provided. Once motor starts running as a synchronous motor, the same d.c. machine acts as a d.c. generator called exciter. The field of the synchronous motor is then excited by this exciter itself.